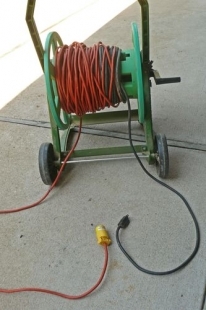 Homemade mobile power cord storage solution utilizing a surplus wheeled garden hose spool for a reel. This is very clever...and I'll bet I could pick one up cheap at a local garage sale. Cool.